The Triathlon Training Group is a fun, dedicated team focused on getting you to the finish line at your first or next triathlon - healthy and prepared! Our professional coaches provide you with structured workouts focused on developing technique and endurance for the cycling and running components. The swim component of the program is captured through the general drop-in swim training provided at various Recreation Centres. A 50% discount is available on a Monthly All-Facility Adult Membership, valid from the first day of the month until the last day of the month. All levels are welcome. Participants must be over 16 years of age. Please Note: Bike trainers are provided for participants, but you must bring your own bike. Helmets are required when training outside. Annett enjoys pushing people to their individual goals. 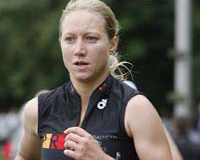 She is one of Alberta's top road cyclists and has been competing as a professional Triathlete since 2007. Kristin has combined her love and knowledge of Triathlon with her professional experience in Speech Language Pathology to coach para-triathletes. Register today for the Triathlon training program at Kinsmen!